1969-1972: Higher Secondary (Science); West Bengal Board of Secondary Education, Calcutta, India. Grade-First Division. 1972-1975: B.Sc. (Honours in Chemistry), Bankura Christian College, The University of Burdwan, West Bengal, India. Grade-First Class. 1975-1977: M. Sc. (Chemistry-Organic Special), The University of Burdwan, Grade-First Class. Rank - First in the First Class. Received University Gold Medal for being placed First in the First Class and Bardhaman Sammilani Gold Medal for securing Highest Marks in Chemistry. 1979-1985: Ph. 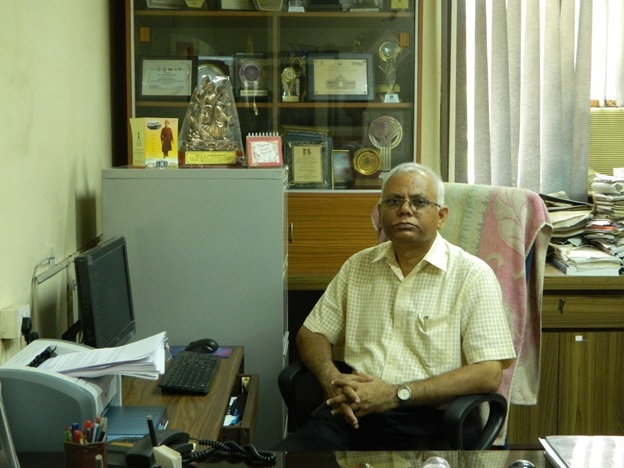 D. (Science), Jadavpur University/IACS, Calcutta, India. 1987 (Nov.)-1989 (Sept.): Postdoctoral Fellowship, Purdue University, Indiana, U. S. A. 1985 (Sept.)-1987 (Oct.): Postdoctoral Fellowship, Clemson University, S. C., U. S. A. 1981 (Feb.)-1985 (Aug.): Senior Research Fellowship during Ph. D. studies in IACS. 1979 (Dec.)-1981: Junior Research Fellowship during Ph. D. studies in IACS. 1975-1977: National Scholarship during Postgraduate studies. 1972-1975: National Loan Scholarship during Undergraduate studies. Ranbaxy Research Award 2004 (Pharmaceutical Sciences). Indian Society for Mass Spectroscopy (ISMAS) Eminent Mass Spectroscopist Award 2009. Chemical Research Society of India (CRSI) Bronze Medal 2006. Fellow, Royal Society of Chemistry, Cambridge, U. K.
Certificate of Appreciation for Thesis Advisor of the National level Rajnibhai V. Patel PharmInnova Awardee (Dr. Priyank Purohit) for the most “Innovative Thesis” in Ph.D. (Pharmaceutical Chemistry) category in Pharmaceutical Sciences 2017-18. Certificate of Appreciation for Thesis Advisor of the National level Rajnibhai V. Patel PharmInnova Awardee (Dr. Pradeep Jadhavar) for the most “Innovative Thesis” in Ph. D. (Pharmaceutical Chemistry) category in Pharmaceutical Sciences 2016-17. Certificate of Appreciation for Thesis Advisor of the National level Rajnibhai V. Patel PharmInnova Awardee (Mr. Sahaj Pancholia) for the most “Innovative Thesis” in M. Pharm. (Pharmaceutical Chemistry) category in Pharmaceutical Sciences 2015-16. Certificate of Appreciation for Thesis Advisor of the National level Rajnibhai V. Patel PharmInnova Awardee (Mr. Dhameliya Tejas Manjibhai) for the most “Innovative Thesis” in M. Pharm. (Pharmaceutical Chemistry) category in Pharmaceutical Sciences 2014-15. Certificate of Appreciation for Thesis Advisor of 2012 Eli Lilly and Company Asia Outstanding Thesis Awardee (S Raha Roy). Certificate of Appreciation for Thesis Advisor of 2009 Eli Lilly and Company Asia Outstanding Thesis Awardee (S V Chankeshwara). Certificate of Appreciation for Thesis Advisor of 2009 Eli Lilly and Company Asia Outstanding Thesis Awardee (S Sundriyal). Certificate of Appreciation for Thesis Advisor of 2013 Eli Lilly and Company Asia Outstanding Thesis First Prize Awardee (Dinesh Kumar). Tetrahedron Letters Most Cited Paper 2005-2008 Award. Bioorganic and Medicinal Chemistry Letters Most Cited Paper 2005-2008 Award. Tetrahedron Letters Most Cited Paper 2004-2007 Award. Tetrahedron Letters Most Cited Paper 2003-2006 Award. Member, National Academy of Science, India, Allahabad. University Gold Medal 1977, The University of Burdwan. Bardhaman Sammilani Gold Medal 1977, The University of Burdwan.